Thread: Speckled Krakatoa Group Buy!!! We've just got in a good handful of Speckled Krakatoas. With so many frags, there's no point in just hoarding them for ourselves. So... we're going to implement a US wide group buy on these beautiful polyps! Not sure if this has been done before, so it's pretty exciting. The regular price on these are $250pp. 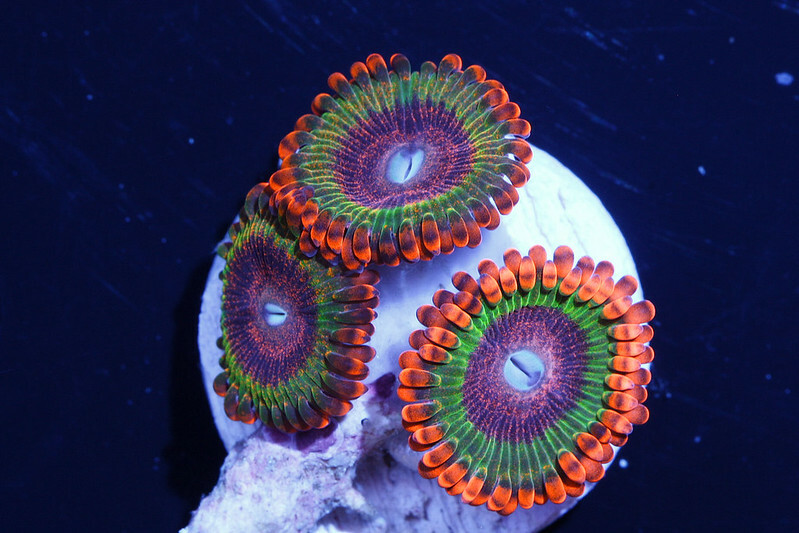 We had 14 polyps about 2 weeks ago with all of them selling out within the first few days. We're going to be giving price breaks on these morphs after "X" amount of polyps have been sold. If we can get 20 polyps sold, we'll break the price down to $200pp. If 40 get sold, the price will be $150 pp. Here's an example of what a 3p looks like. Easily one of the nicest morphs that's come in recently. The Speckled Krakatoa will be listed on our site at $150pp (the lowest price). You are free to purchase as many quantity as you like, as that will count towards the amount of polyps sold. This will allow you to pay for shipping, taxes, etc as you would with a normal coral on our site. You can also purchase other things on our site (or more polyps of the Speckled Krakatoas) to reach free shipping ($350+). You might be wondering why it's set to the lowest price already. The hardest thing about group buys is that you don't know if the group is going to reach the amount needed for the lowest price. You'd be down for a polyp if it was at $150, but don't want to commit to pay $200. So to counter this, we're giving a pretty awesome solution: If the price doesn't reach $150, you may have the option of getting a refund. You won't have to commit to the group buy unless it reaches the amount you want. If it doesn't reach $150pp, you can get a refund. If you'd still like the polyp even if it doesn't reach the minimum, just let us know in the comments of your PayPal order and we'll invoice you the difference at the end if it doesn't reach 40 polyps depending on the total of the group buy. Pretty simple. So ask your reefer friends, local and online, if they want to get in on this deal. The more people that hop on, the better it is for you. We already have frags healed and set aside, with polyp count options as well. There's only limited 1p and 2p pieces, so get them before someone else does. We want to share this morph with as many people as possible, for the best price point. US WIDE GROUP BUY ENDS: Friday, January 29th 2016. By participating in this group buy and purchasing a frag, you commit yourself to purchasing the frag at the minimum cost of $150pp, There will be no refunds on the frags if the group buy does reach 40 polyps. Hmm this is a cool idea! I may have to get in on this! We have 5 polyps committed as of right now. 1/8th of the way! That is a hot one!